Lee Westwood let his golf do the talking as he provided the perfect response to being snubbed by Chris Wood for next week’s World Cup by setting the pace in the $8 million DP World Tour Championship in Dubai. The 43-year-old opened with a six-under-par 66 on the Greg Norman-designed Earth Course at Jumeirah Golf Estates - the same score he signed for in the first round when he won the inaugural European Tour finale here in 2009. Comprising seven birdies, Westwood’s best opening effort in more than a year came in his first outing since Wood selected Andy Sullivan as his partner for next week’s World Cup in Australia despite Westwood having been in line to make his debut in the event until Danny Willett pulled out. Explaining his decision, Wood said that this year’s Ryder Cup had “marked a changing of the guard where guys like myself and Sully have to step up”, but, on this evidence, the big Bristolian may be a bit premature in suggesting that he was writing off experienced campaigners like Westwood. The Edinburgh-based player leads by a shot from Frenchman Julien Quesne and Belgian Nicolas Colsaerts, with Spaniard Sergio Garcia, Italian Francesco Molinari and Dutchman Joost Luiten all a further stroke back in the battle for a £1,052,102 top prize. On a day when defending champion and world No 2 Rory McIlroy slumped to a 75 - his worst score in 29 rounds on this course - Wood and Sullivan were also left trailing in Westwood’s wake. After both finished bogey-bogey, Wood also had to settle for a 75 while Sullivan is third last following a 76. “I have never played in a World Cup before, so I was really looking forward to it, and Kingston Heath is a great golf course,” said Westwood in repeating what he’d said on the eve of the event here in expressing his frustration at being overlooked by Wood. “It’s up to him to pick whoever he wants and he gets on well with Sully, who is a good player. They will have a chance next week. But I’m disappointed not to be playing and it’s probably more to do with the rules than anything. Westwood, who signed for matching halves of 33, has been working with Chris Henry, a former professional snooker player, since struggling badly with his putting at the Ryder Cup in Minnesota. According to Westwood’s manager Chubby Chandler, he’s got the former world No 1 to quicken up his putting routine and he certainly enjoyed a profitable day on the greens on this occasion. “This is as good as I’ve played for some time,” he declared. “I hit a lot of fairways, a lot of good iron shots, putted nicely and didn’t make too many mistakes. I’ve found a couple of keys in different parts of my game and I’ve been working hard on them. Seven years ago, Westwood followed his opening 66 with equally impressive rounds of 69, 66 and 64 as he won by six shots from compatriot Ross McGowan, with McIlroy a shot further back in third. The victory saw him crowned as European No 1 for a third time. Billy Foster, Westwood’s caddie on that occasion, is an absentee this week as he recovers at home with a knee injury. 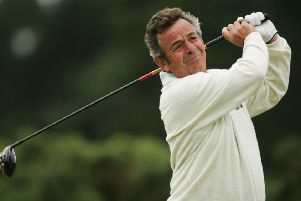 Deputising is Ken Herring, who works for Marc Warren but is available due to the Scot failing to make it into the top 60 in the Race to Dubai. “With me leading after one round and him not being here, Billy will be sat at home kicking himself more than he normally does,” joked Westwood. “Billy normally thinks for me, which is probably a good thing. The big-hitter reckons his game is better suited to this course than either Regnum Carya or Sun City, the courses for the first two Final Series events - the Turkish Airlines Open and the Nedbank Golf Challenge. In contrast, McIlroy had a rare day to forget here. His worst previous score had been 72 and, in 28 previous rounds, he’d been a cumulative 109-under-par. A pulled approach at the first was the catalyst for that now having been reduced by three shots. He three-putted from across the green there then pushed tee shots into bunkers at both the fourth and sixth, where further shots were spilled. The two-time winner then slipped to four-over after having to take a penalty drop as he found a bush from the tee at the tenth before rallying with back-to-back birdies at the 14th and 15th. That good work was soon wiped out, though, when his approach at the 16th found the hazard. His first attempt to get it out left the ball in almost the same spot. Off came a sock and shoe and this time he played a great shot only to miss the putt and run up a double-bogey 6. Despite a birdie at the last, he’s sitting joint-55th in a 60-strong field but was unable to share his thoughts on a disappointing start after being whisked away for a random drug test straight after signing for his card. In the battle for the Race to Dubai title, Open champion Henrik Stenson is still the strong favourite despite his 72 being bettered by both Willett and Alex Noren, sitting second and third respectively in the standings, as they shot matching 71s. Masters champion Willett, who needs to finish in the top four to have any chance of leapfrogging the Swede, has mixed feelings about his day’s work.